New Delhi: Excessive use of chemical fertilisers creates nutrient imbalance in soil and results in reduced productivity and environmental problems. Therefore, it is important to develop innovative and sustainable solutions to meet soaring demands using limited resources. 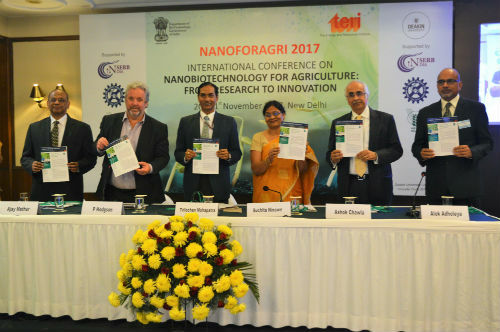 Today, an engaging dialogue was organised by TERI Deakin Nanobiotechnology Centre on “Nanobiotechnology for Agriculture: From Research to Innovation” in New Delhi, where the ‘Zero Draft Policy for Regulation of Nanoproducts in Agriculture’ was unveiled. According to the United Nations (UN), India accounts for 17.84% of the world’s population and by 2025, India’s population is likely to exceed 1.5 billion, simultaneously raising the demand for food grains to over 300 million tonnes as against the current production (2015-2016) of 252 million tonnes. The current fertiliser consumption of nitrogen, phosphorous and potassium has been registered at 23.59 million tonnes (2013-2014). However, the removal of nutrients from soil is far higher than the additions, thereby creating a net negative balance of about 10 million tonnes from soil every year and causing a serious threat to soil health. The conference provided an interactive platform to showcase technology snapshots, discussions and deliberations in focused thematic sessions to understand the innovation space and scope for nanobiotechnology interventions to address pressing issues in agriculture. Considering the advancements in science and technology, nanotechnology is being visualised as a rapidly evolving field that has the potential to revolutionise agriculture and food systems. The conference aimed to develop a deeper understanding of advances in nanobiotechnology in relevant areas, encourage interaction within the research community for wider application and benefit society by innovating to achieve sustainability in agricultural practices in India.